If you own a dataset, you can add your own featured questions to that dataset. 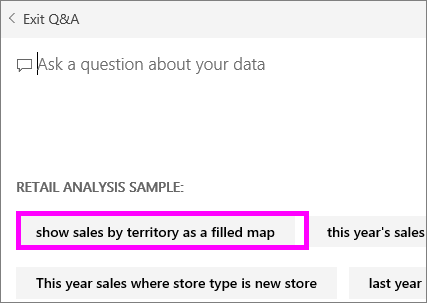 And Power BI Q&A will show those questions to colleagues who use (consume) your dataset. Featured questions give your colleagues ideas about the types of questions they can ask about the dataset. The featured questions you add are up to you -- add popular questions, questions that display interesting results, or questions that may be hard to phrase. Watch Will add some featured questions to Power BI Q&A and then use those featured questions to explore his dataset. Then follow the step-by-step instructions below the video to try it out yourself. Q&A featured questions are available for use in the Microsoft Power BI app for iOS on iPads, iPhones, and iPod Touch devices and Power BI Desktop Q&A Preview. But creating the questions is only available in Power BI service (app.powerbi.com). This article uses the Retail Analysis Sales sample. On the dashboard, select the Q&A question box. Notice that Q&A is already being helpful by displaying a list of terms that appear in the dataset. To add to this list, select the gear icon in the top right corner of Power BI. 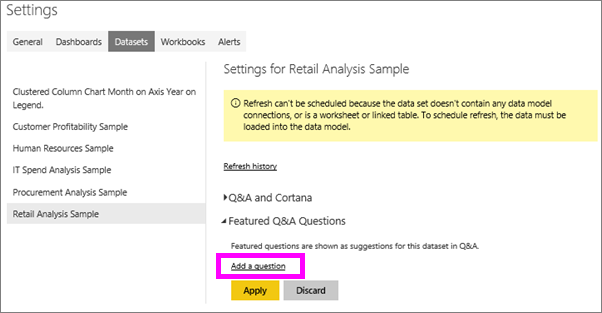 Navigate back to the Power BI dashboard for Retail Analysis Sample, and place your cursor in the Q&A question box. 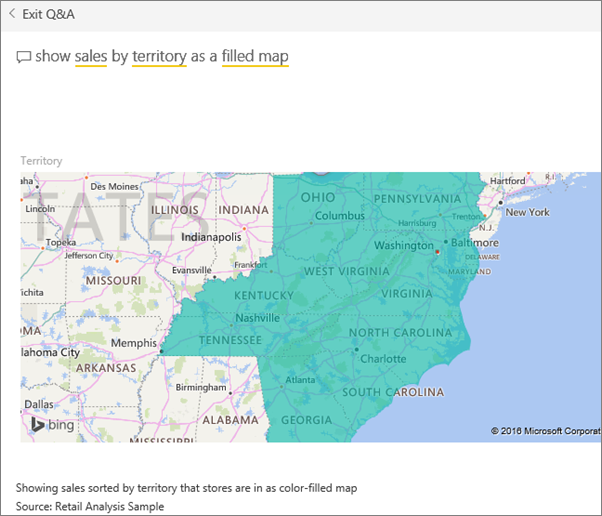 The new featured question, Sales by territory as a map, is first in the list. Select it. The answer displays as a filled map visualization.